Some superficial tooth stains that do not come off with a professional cleaning may sometimes be removed through a process called “Enamel Microabrasion”. A dilute solution of hydrochloric acid is rubbed on the tooth surface for a few minutes. This removes a little bit of the superficial tooth structure which is the discolored part. The effects of this tooth stain removal treatment will continue to work for up to 2 weeks post-operatively. Enamel Microabrasion is accomplished comfortably without anesthesia. Before– Brown stains are on this patient’s front tooth. 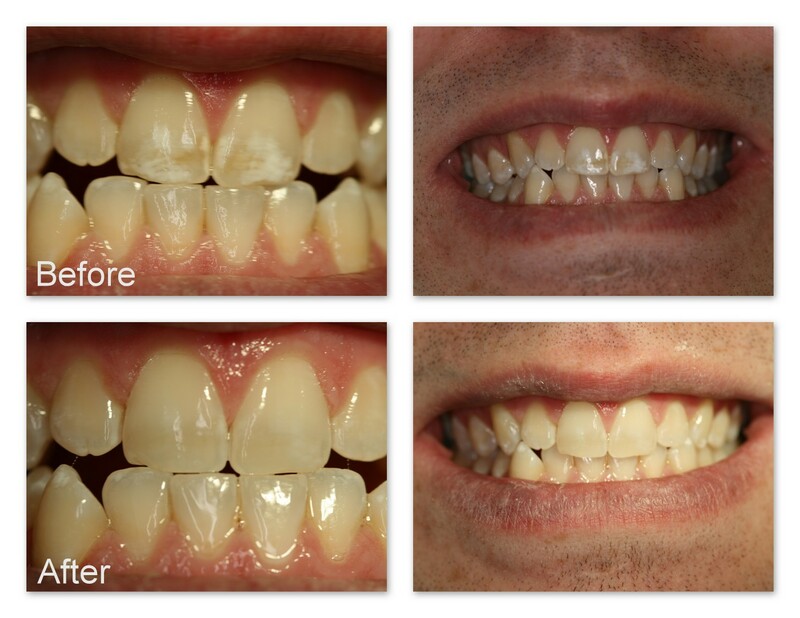 After– Dr. Jack Hosner of Portage, MI removed the stains comfortably without cutting the tooth. Before– Staining and decay on these teeth bothered the patient. 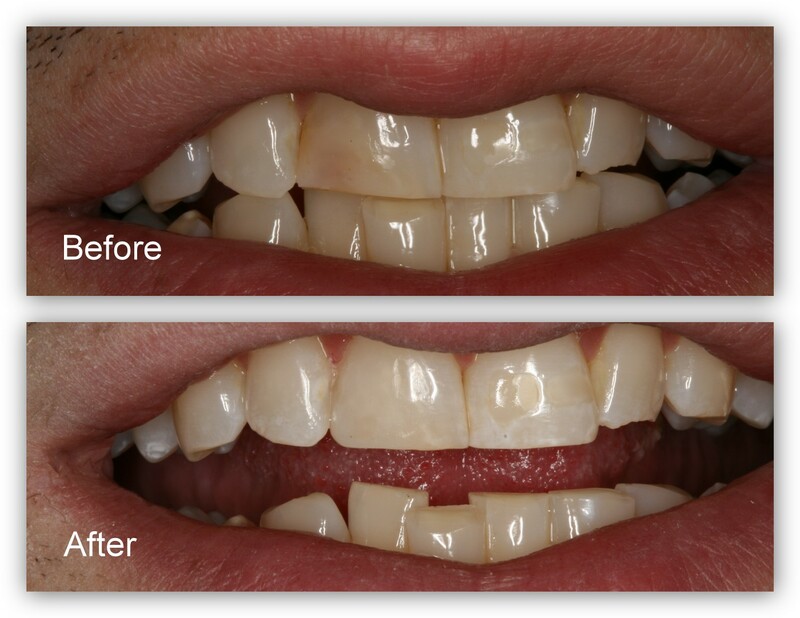 After– Dr. Jack Hosner of Portage, MI removed all decay and staining and bonded tooth colored restorative material to recreate a beautiful and natural appearance. 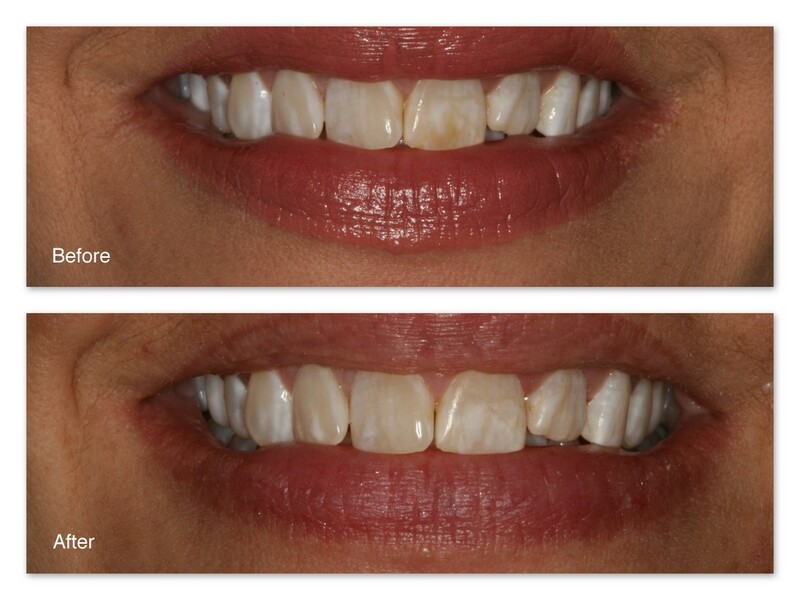 Before– This patient did not like the white opaque stains on her two front teeth. After– Dr. Jack Hosner of Portage, MI cut the stains away and bonded tooth colored dental material to the teeth and polished them to blend seamlessly and unnoticeably. Before– This patient doesn’t like the dark stains on his teeth that he has had most of his life. 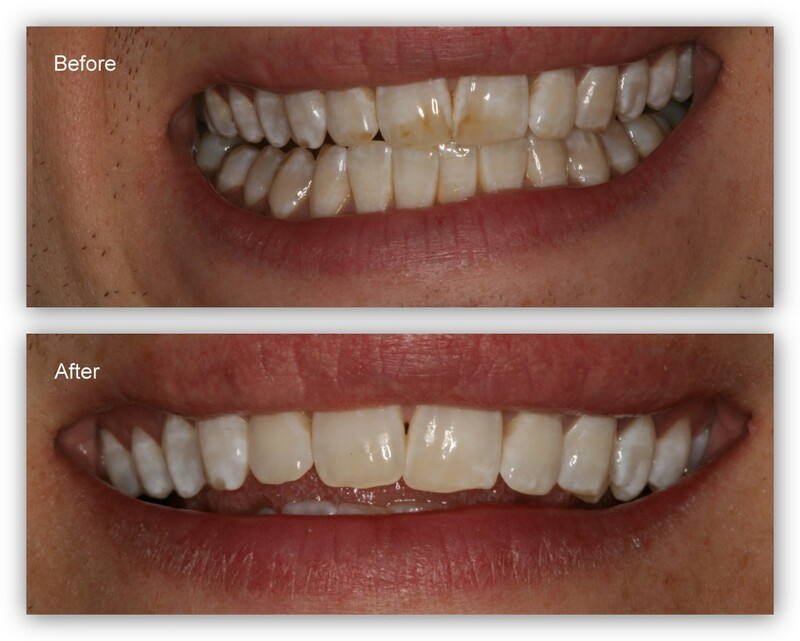 After– This picture was taken over two weeks after Dr. Jack Hosner removed the stains with a weak acid polishing paste. Notice the improvement. The acid continues to remove stain for up to two weeks after the initial treatment. Before– This patient didn’t like the brown and white spots on his teeth. After– Dr. Jack Hosner of Portage, MI removed the stains in a few minutes comfortably without anesthetic. Before– Naturally occurring white spots on front teeth. 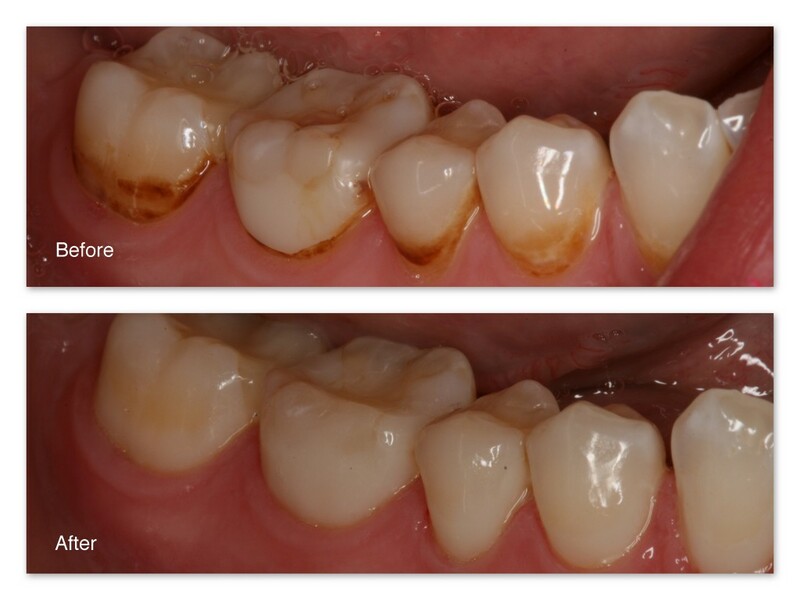 After– After one short in office treatment, Dr. Jack Hosner of Portage, MI removed most of the stains. 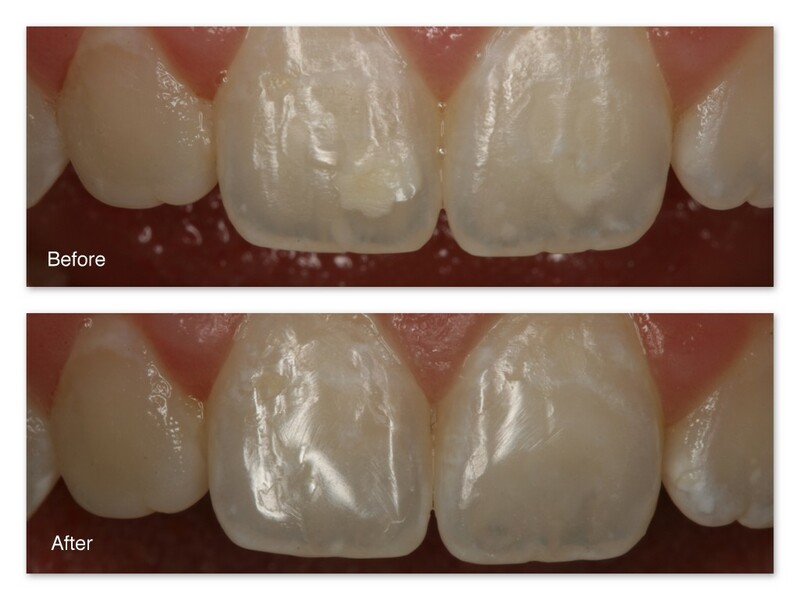 A second treatment may remove the remaining stains, or composite bonding may need to be done; however, this patient was happy without any further treatment. Before– White, opaque blotches on the upper front teeth. After– Dr. Jack Hosner of Portage, MI removed the stains in just a few minutes. Before– This patient didn’t like the white lines on her teeth which was a result of bacterial accumulation around her braces and subsequent decalcification of the enamel of her teeth. After– Dr. Jack Hosner of Portage, MI removed the white opaque lines from her teeth gently and comfortably without anesthesia. 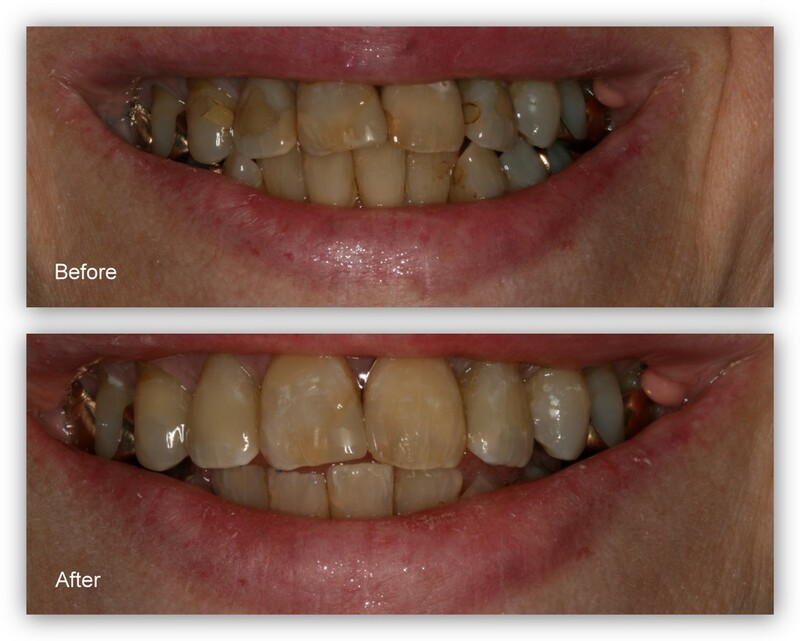 Before– This patient didn’t like the appearance of the brown stains and old fillings on her front teeth. 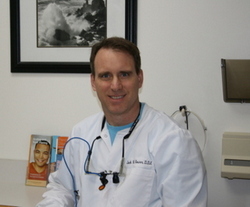 After– Dr. Jack Hosner of Portage, MI removed the old fillings and stains. New composite resin fillings were bonded and polished to provide a more acceptable appearance. Before– This patient did not like the dark brown color of his old filling on the upper left front tooth. After– Dr. Jack Hosner of Portage, MI replaced the old, stained filling to restore better esthetics.